On 27 April, 2007, members of Ka ‘Imi Na’auao o Hawai’i Nei, led by Roselle Bailey, will perform opening protocol at Kaua`i Museum for the Sailing with Lata exhibition. 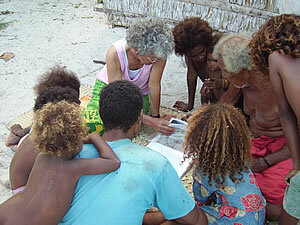 The exhibit is being organized to celebrate the tenth anniversary of the Vaka Taumako Project, which began in 2006. 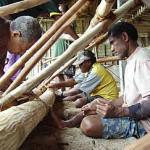 Briefly, the Vaka Taumako (a canoe for Taumako) Project was started in 1996 by the Paramount Chief of Taumako island in the eastern Solomons, Koloso Kaveia to preserve and teach the traditional canoe building and navigation skills of his people. Nga Taumako (the people of Taumako) are some of the last few Poly- nesians who still know how to build and sail long-distance voyaging canoes in the way their ancestors did. 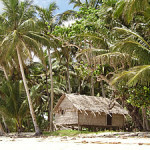 To find out more about this project, visit the Vaka Taumako section of this site, or visit www.vaka.org. Many of you know that Ka `Imi has been associated with the VTP from its inception. 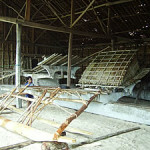 In September of 1997, Roselle was invited to to Taumako to bless the launching of three voyaging canoes, the first ones to have been built on the island in decades. 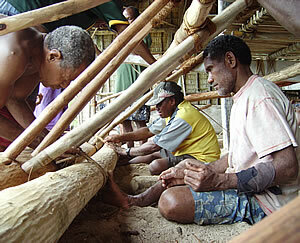 Ka `Imi members have also helped host Taumako people who have come to Hawai`i as guests of the VTP. For this reason, the VTP have asked Ka `Imi to honor the exhibition opening with oli and mele. The celebration will take place at the Kaua`i Museum in Lihu`e at 5:00 p.m. It is a free event and open to the public. Some of you will receive invitations from Kaua`i Museum. Even if you do not, you are still welcome to attend. Here are some photos to show you a bit about Taumako and the VTP. Perhaps these will inspire you to join us on 27 April, or to visit the exhibition at another time. It will stay at the Museum until 31 October, 2007. 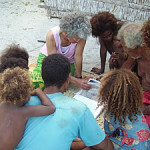 Paramount Chief Kaveia and Vaka Taumako Project Principal Investigator Dr. Mimi George show computer generated diagrams of Nohoanga te Matangi (dwelling of the wind – the wind compass that Kaveia uses to direct a canoe) to an interested audience at Kahula Village on Taumako island. The Sailing with Lata exhibition will feature diagrams like these. 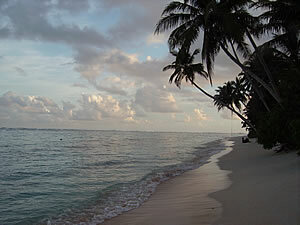 Anyone interested in Polynesian navigation should find them most interesting. Tohua island in Kahula’s lagoon. 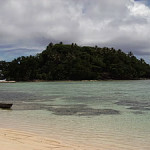 On this island Lata, Chief Kaveia’s ancestor and, according to Taumako tradition, the first person to build a voyaging canoe of the tepuke class, was born. Lata is a name that ought to ring bells with students of hula, because it is identical with Laka, the divine patron of dance. As Peter buck once wrote, “All Polynesia knows the tale of Rata…”. 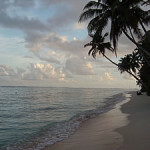 Indeed, the character known variously as Lata, La`a, Laka, Rata, La`amaomao, etc., appears throughout the Pacific in various guises. The Vaka Taumako Project exhibit is titled “Sailing with Lata, the original Polynesian Voyager” for this reason. One section, titled “Who is Lata?”, will explore the nature of this complex and fascinating personage. 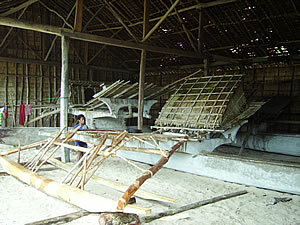 Kahula’s hale vaka (canoe house), where voyaging canoes are stored. 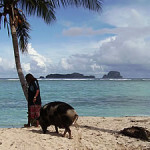 Chief Kaveia’s daughter, Vaka Taumako, takes her pig for a swim on a hot afternoon. 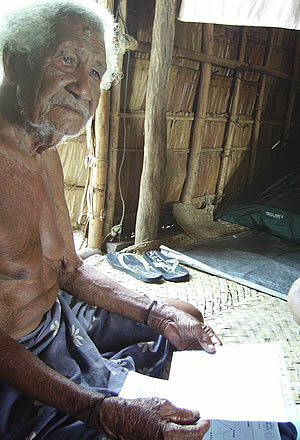 Nga Taumako are subsistence farmers and fishermen. 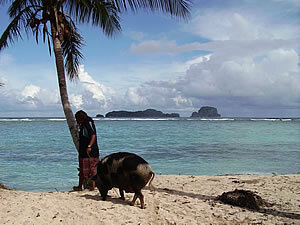 Living on a small island far from major shipping routes, they must be self-sufficient in food production. Pigs like this one will only be eaten on special occasions like weddings or important holidays. On most days, they will eat fish and kumara, taro or yams. 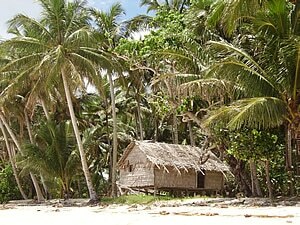 Nga Taumako (Taumako people), like most Solomon islanders, live in traditional “leaf and stick” houses. Here is a typical example. 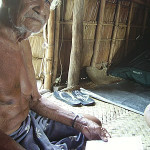 Paramount Chief and Master Navigator Koloso Kaveia. 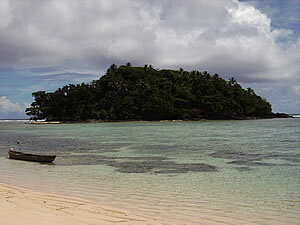 The beach at Kahula, Chief Kaveia’s home and the birthplace of his ancestor Lata. Lashing the ama (outrigger) of a voyaging canoe.